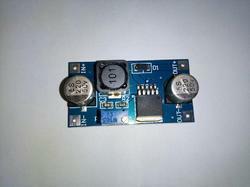 We offer Innovative Electronics Products. It seems like everything plugs in to your computer these days, and this digital multimeter is no exception. 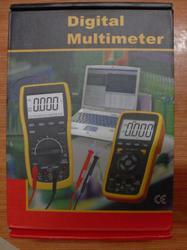 This auto-ranging multimeter will test AC and DC voltage and current as well as capacitance, resistance, frequency and even temperature. It features a large, easily readable display for use in the field as well as the ability to connect to your computer for data logging, processing and analysis. It has all of the basic functions that you expect from a good digital multimeter including continuity check (with buzzer), diode test and data hold. Data logging and analysis software is included on a mini-CD and you can also download it below. Note: The included CD contains all versions of the software. 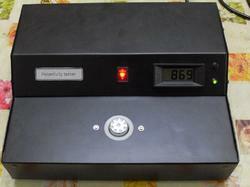 The version that has been tested to work with this unit is version 3.0. You can also just use the download link below. Note: This meter does have a USB interface, but it's not clearly RS232. The meter needs the proprietary software to function and you cannot simply read the data directly without a driver and the software. 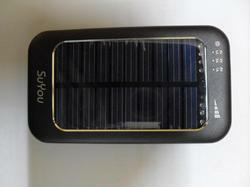 Description: This solar charged battery pack is the size of a cell phone but packs a 0.6W solar cell, charging circuit, boost converter and 3500mAh of Lithium Polymer storage. Simply leave the battery pack with the solar panel facing up and when you need power, press the power button and dial over to the voltage you need. 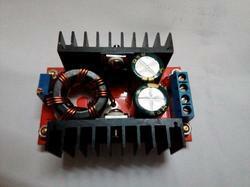 The unit has 9V/1A output as well as 5V output at either 1 or 2 Amps. We enjoy this product, and the young lady in the datasheet seems to thoroughly enjoy it! A standard USB-A type connector makes it easy to plug this thing into your favorite device and mini-B port can be used to charge the pack when you don't have access to (or patience for) solar power. 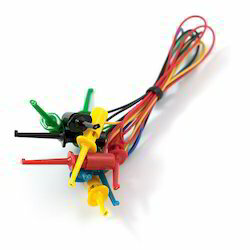 Note: Although the datasheet shows an assortment of nice proprietary cell phone connectors for you to throw away, we've saved you the trouble by ordering these units without the connector pack. You'll only receive the unit itself. You probably have a USB cable laying around somewhere, don't you? If not, check the related products below. 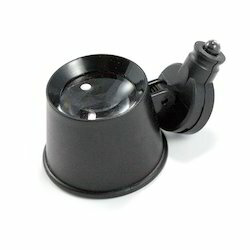 magnifier, but there is no attached aluminum-core headband. inspections. The LED provides sufficient light at the working distance. oscilloscopes, function generators, etc. Cables come in red/black pairs. We deal with 3in1 pointer. This DC Blower really moves some air! Pulling about 1Amp @ 12VDC, this blower is rated at 16CFM (although it seems like more to us). We’ve used this blower to build small hovercrafts and to cool off on a hot day, they’re also handy for inflating “transforming” e-textiles garments! 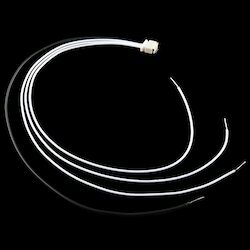 These are various leaded cables for attaching to multimeters, power supplies, oscilloscopes, function generators, etc. 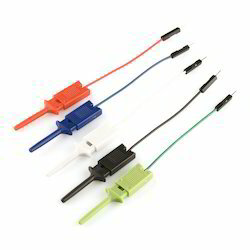 5 pairs of IC Hook to IC Hook test leads. Comes with Black, Red, Blue, Green, and Yellow colored leads. legs). 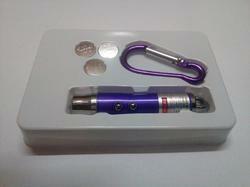 Comes in a bag of five IC hooks of different colors (black, red, white, blue, and green). We use them with the Bus Pirate logic analyzer harnesses but are very cool on their own. Wire length is 2.5" long. Male pin easily inserts into breadboard or other standard 0.1"
IR Remote control is a combination of Infrared transmitter and Infrared receiver which contains 4 relays and 1 Fan Speed Control through TRIAC, which can be controlled wirelessly. This makes the unit very easy to operate and integrate with existing systems. 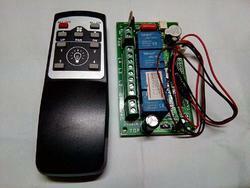 The remote control operate the corresponding relay on the receiver board, i.e. Light 1 operates relay 1, Light 2 operates relay 2, etc. Relay contact can control any equipment in momentary mode (On till key pressed) or Latch Mode (Toggle on each key press). Each relay has indicator LED showing current status. The transmitter uses a modulated 40 kHz carrier to transmit data about which button is pressed. This method is used in all IR remote controls as it offers a high degree of noise immunity against interfering light sources. At the receiver end the IR receiver module extracts the data signal from the carrier. This active HIGH output is used to operate a relay via ULN2803 which is an octal transistor array. Memory backup - Memory backup saves last condition of relays if power has gone with FAN speed also. 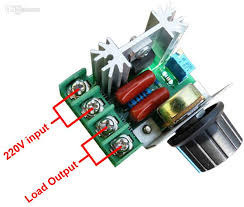 Specifications:Module Properties: Non-isolated step-up module Input voltage: 3-34VOutput voltage: adjustable (4-35V)Output current: 2.5A (MAX)Input current: 3A (MAX)Size: 49mm x 26mmInput mode: IN+ input positive IN- input negative Output mode: OUT+ output positive OUT- output negative Adjustment method: First, connect the correct power supply (3-34V) and then using a multimeter to monitoring output voltage and adjust the potentiometer (Chronological turn is step-down, Turn in reverse is step-up). We offer magnet sheild cover testing equipment . 1. Provides retentivity value based on the processed / annealed component . 2. Very compact & easy to use . 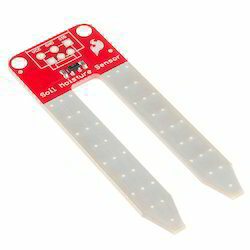 Description: The SparkFun Soil Moisture Sensor is a simple breakout for measuring the moisture in soil and similar materials. The soil moisture sensor is pretty straight forward to use. The two large exposed pads function as probes for the sensor, together acting as a variable resistor. The more water that is in the soil means the better the conductivity between the pads will be and will result in a lower resistance, and a higher SIG out.To get the SparkFun Soil Moisture Sensor functioning all you will need is to connect the VCC and GND pins to your Arduino-based device (or compatible development board) and you will receive a SIG out which will depend on the amount of water in the soil. One commonly known issue with soil moisture senors is their short lifespan when exposed to a moist environment. To combat this, we’ve had the PCB coated in Gold Finishing (ENIG or Electroless Nickel Immersion Gold). We recommend either a simple 3-pin screw pin terminal or a 3-pin jumper wire assembly (both can be found in the Recommended Products section below) to be soldered onto the sensor for easy wiring.Note: Check the Hookup Guide in the Documents section below for assembly and weatherproofing instructions as well as a simple example project that you can put to together yourself! Support µEM4001, 4100, or its compatible RFID, ID card. 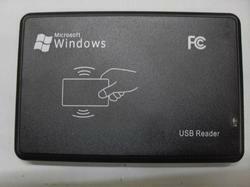 Read first 10 digits of the RFID/Proximity card. We can connect 10mt to 100mt from base unit to calling display. One base unit 2 or 3 or 4 no's calling display connectivity also possible with our technology ( this model price will special). Serial Communication design makes us very easy to use. wires. Test resistors, capacitors and diodes one-handed! 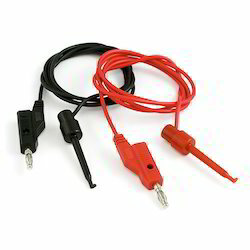 These are various leaded cables for attaching to multimeters, power supplies, oscilloscopes, function generators, etc. 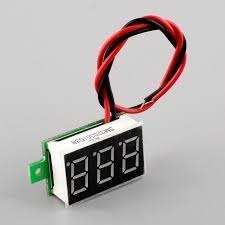 This panel-mount 9V battery holder is perfect for projects where you have limited panel space but still need to get to your battery to change it. Simply install this battery drawer and your 9V battery will hide out of harms way. Mounts with two screws in the front (not included) and wires in with two solder tabs on the back. This 3xAA battery holder puts a nice finishing touch on your battery powered project. This holder features a removable, sliding cover, which is secured with a small phillips head screw. Another bonus is the ON/OFF switch which can be used to control power to your project. This is a simple coin cell battery holder that can enclose two CR2032 batteries inside itself, and safely kept closed via two phillips head screws. 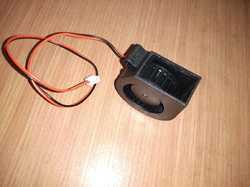 Each battery holder will run batteries in series, output up to 6V, and is equipped with an On/Off slide switch and two 6" power wires (one positive and one negative) on the back. These color-changing LEDs take the work out of creating crazy, flashy, blinky… ness. Simply apply power and the LED will cycle through the RGB colorspace: no external controller necessary! These bright and festive LEDs make great decorations, LED “throwies”, indicator lights, etc. Typical forward voltage is 2V. These 10mm LEDs are of the “fast-changing” variety, meaning they fade-cycle very quickly through several colors and then flash-cycle through several more colors before starting all over again. This solenoid is rated for 36V but they work like a charm at 12V. We’ve been controlling them with the Arduino Power Driver Shield, there’s even some example code below. With a throw of 10mm these solenoids are great for all kinds of motion applications such as actuating door latches, automating percussion instruments or just poking people. We deal 8 channel relay unit. Specifications:Brand new and high quality.Applicable appliance: electric furnace, water heater, lamps, small motor, electric iron etc.Input voltage: 220V.Maximum power: 2000W.Adjustable voltage: 50-220V AC.Material: plastic, metal.Size: 4.8cm x 5.5cm x 2.7cm.